Sign up for Rewards Programs! 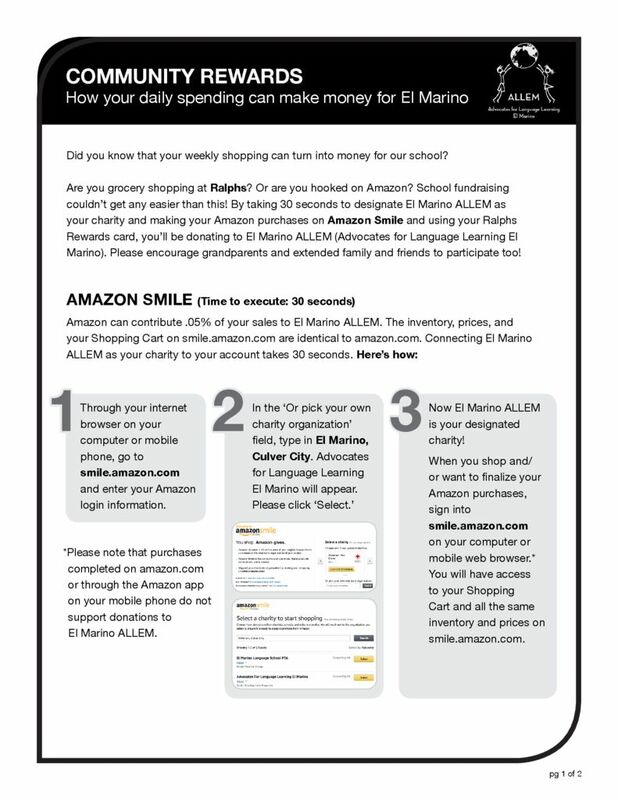 If you shop and Amazon or Ralphs, there’s an easy way to help ALLEM while you shop. Please click on the image below to view a detailed flyer on setting up Amazon Smile and Ralph’s Community Rewards. It only takes a few minutes! A special thanks to Sean and Tina Starkweather for putting these easy-to-follow intructions! EL MARINO LANGUAGE SCHOOL is a public elementary school that offers a Spanish Immersion Program (SIP) and Japanese Immersion Program (JIP). The goal of both programs is for students to master grade level content while learning to speak, understand, read and write in both English and the target language.